Your goods are safely secured in elevated wooden containers away from the elements. We’ve created a checklist for you to download to help things run smoothly. we are an authorised insurance representative (number 317340) and we can arrange insurance for any part of our services including storage insurance. With over 20 years of expertise assisting the transition of families and businesses, Delco Removals and Storage is Australia’s trusted removalists. Moving doesn’t have to be a stressful experience; we’ll support you every step of the way and will strive to exceed your expectations. Our team of movers take great pride and care in delivering a professional and personalised service at an affordable rate. Whether it’s a full house or just a few items you need moved, call Delco Removals and Storage on (08) 8326 5333 or get a FREE online quote today! 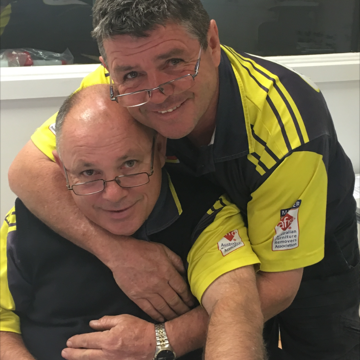 Graham and Andrew Dellow are brothers and have worked in the transport industry for over 40 years. Graham and Andrew started the business over 20 years ago with their Dad, Eric. Eric has since retired. Over the last 20 years the boys have built a strong and respected name in the industry and take great pride in providing our clients with a professional, efficient and personalised service. We have grown form starting with one truck to a fleet now of 7 vehicles. The office staff are also family, with Jan (Grahams Wife) our office manager having over 20 years industry experience and her daughter Vanessa, our operations manager, who has 26 years’ experience in the transport and furniture removal industry. The rest of our team are professionally trained and work to a very high standard. For more information on our local/ interstate removalist services to/from Adelaide and short term storage solutions, contact us for a FREE online removalist quote today.